The Visiting and Home Teaching message for May comes from the April session of General Conference. There were SO many amazing talks and quotes, don't you think? We chose a few of our favorite one-liners, and designed the handout so they can be easily read and enjoyed. 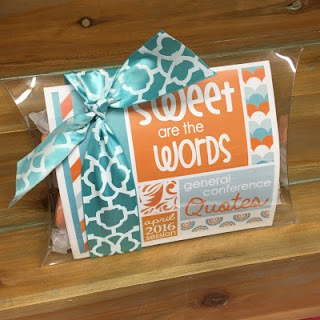 We've filled a clear plastic pouch (approximately 5.5"x 8.5") with the handout and approximately 15 pieces of delicious orange and cream salt water taffy (it really is so good!). Finished off with a teal ribbon it's all ready to give, and your sisters will be happy to see you coming! Buy online here or stop by our store at 154 W Main in Lehi!